Our "local" splash pad, it seems, has it out for me. I put local in quotes thanks to the fact that it's actually a 15 minute drive from our house, but when you choose to live in a slightly more rural location, a 15 minute drive is about as local as it gets when it comes to amenities like that. I've now tried to bring Elise there twice, and both times I have been supremely thwarted. The first time, I got Elise all ready to go, and we hopped in the car with my mom. Elise fell asleep on the way there - no big deal, since it was a short drive - and when we arrived we found a line of cars in front of a closed gate. It turned out that everyone in each of the surrounding towns had the same idea, and the splash pad was "full." The gates wouldn't open for another 45 minutes, and there was no way I was going to sit in a car with a napping baby on hot asphalt for that long. We turned around and went home. The second time was this morning. Elise woke up early, and so I figured we'd go straight there after getting ready for the day. That part worked! We got in the car before 9:00, and drove merrily along until we were nearly there. At the very last turn, we came across a police man in a nice yellow vest directing traffic in front of a sign: "ROAD CLOSED." "Well," I thought to myself, "a road has two ends; I bet the other end is open!" We took a detour to the other end. Can you guess what we found? If you guessed another road closure sign, you'd be right. Thwarted again! Who closes an entire road for what I can only assume was a small patch of construction? And what about the people that live on said road? I'm not over it, apparently. 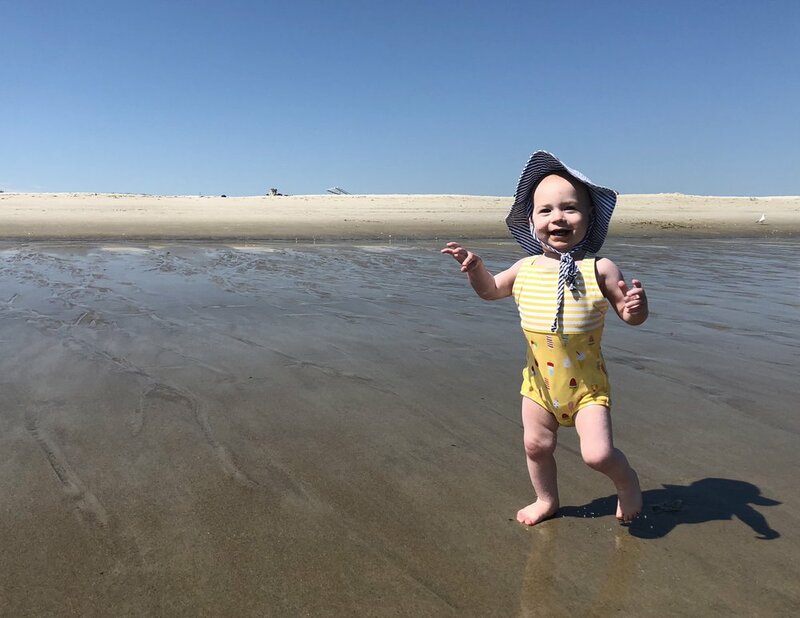 Nevertheless, I was determined to get Elise to some fun water, and we were closer to the nicest beach in the area than we would have been at home, so we did a quick about face and headed that way instead. While the entry fee to the beach was a little steeper than I anticipated, it was a glorious day, and since we had gotten an earlier start, not many people had arrived yet. We set down our bag, slapped on the sunscreen, and I let Elise roam...while staying approximately 2 inches behind her every time she ran in the direction of the water. She absolutely loved it, and if you asked her, she might even say that it was more fun than the splash pad. That said, she's never been to the splash pad. Maybe the third time will be the charm.